Custom HR.my User Role - You may now set up custom user roles with fine-grained control over the access rights of users that you grant access to Employer account, such as limiting Leave Administrator Role to manage leaves only in Employer account. 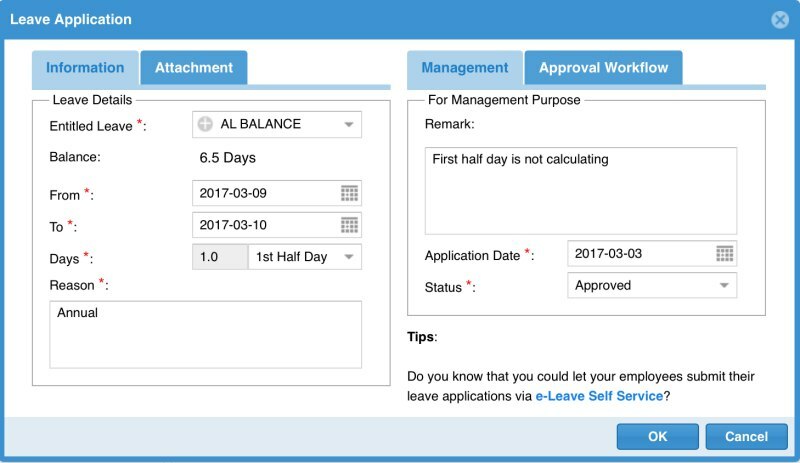 Payroll Management and Payslip for global users. Multiple Employee Web Accounts (with different Employers) consolidated by a single email address . File Storage Management for users to delete uploaded file attachments (particularly those related to leave applications). The image is not attached, can you please re-upload? Ha, I see your problem now. It's not a bug, it's by design. OK, if you select Full Day, that will become 2 days for your current application. If you select either 1st or 2nd Half Day, it will become 1 day. Because it means you apply 1st half day in both 9 and 10 of March. If you need to apply 1 and a half day, you will have to separate it into 2 leave applications.